While many great moments on the field have been captured by photographers—Alexander striking out Lazzeri, Ruth’s 60th home run, Jackie Robinson’s debut, Larsen’s perfect game—many were never taken. What, in your opinion, is the most significant, newsworthy moment not captured? I’ll go first: Ray Chapman’s beaning. It’s almost inexplicable to me that no one took a photograph of Chapman surrounded by his teammates or being carried off the field by Speaker and Wood. I will also add the following conjecture (which may be refuted by your posts): subsequent to Chapman’s beaning, there has never been a significant, newsworthy moment on a Major League field that has not been captured by a photographer. Last edited by sphere and ash; 09-15-2018 at 09:02 AM. I’ll make a second, related conjecture: that you can’t name a single, significant, newsworthy moment on a Major League field that was captured prior to Chapman’s beaning (actually I’m aware of one that purports to be, but it lacks any context to verify that it is what its caption claims, and I have doubts). If you know of an example, please post it. Last edited by sphere and ash; 09-15-2018 at 09:04 AM. Obviously you are referring to the Merkle play and the one photo of him leading off first (maybe). That would certainly be one to have commemorated. All of these obviously predate the Chapman beaning and would be incredible images to have for posterity. Last edited by btcarfagno; 09-15-2018 at 09:54 AM. Is there a photograph of the Homer in the Gloamin'? I'd like to see Steve Dalkowski throwing the ball through the wooden fence. Tom—I was actually referring to a different photograph, but the Conlon image of a player leading off first against the Cubs in 1908 is another example. I actually own the photograph, so I have a real incentive to push for the Merkle identification, but I believe very strongly that it’s Herzog and not Merkle. I hadn’t thought of some of your examples, but like them all. Ken—here’s the Homer in the Gloamin’. Last edited by sphere and ash; 09-15-2018 at 10:13 AM. Interesting you should mention that moment. After watching '42' I googled that image, as well as the images of Robinson and Chapman making up and a few others. The Robinson/Chapman photos do actually match up with the movie well, but as you say, it's disappointing to not find the Reese/Robinson. Not only is there no photograph of Pee Wee Reese putting his arm around Jackie Robinson, there is not a single mention of it in the contemporary press. There is some speculation that the event never happened. However, that’s how Jackie Robinson remembered it. I added that it wasn’t mentioned in the press to defend my conjecture that there hasn’t been a significant, newsworthy moment since Ray Chapman that hasn’t been photographed; if this event had been considered newsworthy at the time, it would have been mentioned. A good article on the Pee Wee and Jackie question. Lester Rodney, writer for the Communist paper The Daily Worker, remembers the event though he only wrote about it many years later. This was 1910 wasn't it? Not really a famous moment, but this was the one I thought of when you mentioned famous action shots. I'd be curious if any photos of the 1919 World Series show any "fishy" moments. Seems like there'd have to be one. Yes, it was 1910, but Conlon didn’t photograph the play because it was significant; it’s significant because Conlon photographed it. Despite nearly forty years taking baseball photographs, Conlon never photographed a newsworthy moment; he was primarily a portrait photographer. The 1919 World Series helps support my conjecture: there isn’t an image of Morrie Rath being hit by Cicotte’s first pitch. During the 1920 World Series, by comparison, there are photographs of the triple play and the grand slam home run; the entire game was chronicled. Last edited by sphere and ash; 09-15-2018 at 03:04 PM. I don't know camera history well enough, but I suspect large film rolls and auto advance weren't available until well after 35mm became the standard. I can give a bit of a glimpse at why any important event from the 70's on was probably photographed. A friend of mine worked at a camera shop that had a number of pros as clients. One did semi freelance work for one of the Boston newspapers. They'd give him a list of shots they wanted for articles, plus if anything special happened they'd pay extra. It seemed like a cool job, but after looking for the photo credits I was amazed at how many nice shots he got. So I asked how. The answer was that he always brought 3 cameras that had auto advance and worked from either a 1000 or 3000 image roll of film. He often ran two at once, and took somewhere around 10,000 images each home game. He'd usually have the rolls developed and remove the shots the globe wanted keeping the rest. So if say "Yaz batting" was on the list they'd get every frame he took during his at bats. When something special and unexpected happened he usually gave the paper the entire rolls of film undeveloped. I forget what it was exactly, but on particular one he actually left the game and brought the film directly to the paper. They developed it and had the picture in the afternoon edition, well before anyone else. yes, he was paid pretty well for that one. I'd love to find his file of negatives, assuming the weren't tossed out at some point. Most of the greatest photos taken in the early 1900's were not of famous plays, but rather of famous players. The cameraman set up to maximize his chance for success, but we've all done that and ended up with garbage. In today's age of iphone photos, many people forget the time that was spent setting up a shot - lighting, depth-of-field, etc. for a roll of film that gave you 24 or 36 shots and you had to wait a while to get the prints back, and then you had to hope they didn't screw them up. If you look up what Ansel Adams did to set up a shot you'll get the extreme version, but a Charles Conlon effort was much closer to Adams than it was to a photographer even from the 1970's, much less a millennial with an iphone. I've gotta imagine that there are still some amazingly historic photos out there that will come to the public eye soon, whether it's through private collections or photo morgues...they just gotta...I hope. That being said, I'd say the Chapman Mays incident is definitely a biggie in terms of significance. I've definitely never seen any shots from that game, but considering there's no shortage of photographs from the 1920 Yankees season (especially because of Ruth), I feel like somebody must have taken a shot of it, Afterall, when the beaning happened, Ruth was sitting on an astounding 42 home runs, and the Yankees were in the middle of a pennant race with Cleveland and the White Sox. So with the former coming to New York for the last time that season, it had to be considered an important series. I don't know, I'm just thinking out loud. I bet that photos were taken of the incident, but maybe they're long gone. And that's whether they were never published by any papers, or were and the negatives/prints were trashed at some point. FWIW, I would also LOVE to see an image of Rath getting beaned during the 1919 World Series. What saddens me is that we know that less than twenty years later, having a photograph of the first pitch in the World Series (many times the first pitch for each game) was often done. And, at least by '36 or so, those photographs were often taken from behind home plate with the outfield in clear view. Can you imagine how cool it would have looked to have a photograph like that of Rath facing Cicotte? Even if he got plunked with Eddie's second offering, I just think the significance is insane. Pair that with a photo from the Chapman beaning and you have two of the major hinge points to the coming of Babe Ruth's celebrity. Man, I love this game. And for sh!t sure I'd love to paint either one. I don’t believe that the absence of any significant, newsworthy moment prior to October 1920, nor their ubiquity after that date, has anything to do with automatic film loading or advancing. I believe it has something to do with technology, but that technology already existed by 1917; there was just no need for it in baseball photography until October 1920. There is something else that created that need. There was at least one photographer at the Chapman-Mays game, from the New York Daily News. I think it’s likely, however, that he left before the beaning, either because he had what he needed or because he had to meet a deadline for an evening edition. One can never say that no photograph of a historic moment before October 1920 will appear because of the problem of induction, but I think it is extremely unlikely. I tried to comb the Daily News’ photo morgue to see if they had a photograph of Chapman, but couldn’t gain admittance. I’ve been through all of the Daily News’ paper archive for 1920, however, and there was nothing about it, so I doubt it’s there. Last edited by sphere and ash; 09-16-2018 at 09:20 AM. I’m re-upping my challenge to this impressive group: that you can’t point to a single, significant moment on the field that was captured photographically prior to October 1920. And that you can’t point to a single, significant moment that was *not* captured after October 1920. These are pretty extreme statements, and I’m curious to see if they can be refuted. If anyone can do it, it’s this group. Finally, do you care how it came to be? Or is this merely of interest to a tiny handful of photography specialists? Some of the earlier 3000 hit milestones I dont believe were not chronicled. I cant remember seeing anything on Cobb or Speaker getting theirs in 1921 but I seem to remember seeing Eddie Collins in 1925 but even that might have been an older stock photo used for the event. By contrast, in 1942 when Paul Waner was closing in there were photographers everywhere and his actual 3000th hit was captured at field level. I also dont remember seeing anything from the actual game where GC Alexander got his 300th win in 1924, but by the time Lefty Grove did it it was well documented. A lot of it had to do with the fact that we put a huge amount of emphasis on these events today but back in the day, I dont think people cared as much. Going back to the 1919 World Series, it is VERY weird that there are more images of the 1918 and 1920 series than 1919. Maybe gamblers got to the newspapers and paid them off too! Another major controversy in Cobb's career occurred in 1912, and this led to the first players' strike. During a game in New York on May 15 of that year, Cobb was subjected to vicious and unrelenting heckling from the fans, especially a disabled man named Claude Lueker, who for several years had made sport of heckling Cobb whenever the Tigers visited Hilltop Park. Finally, unable to stand the abuse and urged on by his teammates, Cobb went into the stands and attacked Lueker, who had lost one hand and most of the other in a printing press accident. When he was informed of the incident, Ban Johnson suspended Cobb indefinitely. Despite their dislike for Cobb, his teammates were outraged, and announced that they would not play again until Cobb was reinstated. After a one-game farce in which the Tigers fielded a team of semipro players, the matter was resolved when Cobb's suspension was reduced to ten days. The Lueker incident is a great case in point. Thank you for the newspaper image. What strikes me is that Lueker was attacked on May 15; the newspaper image is five days later. Why didn’t anyone capture Cobb beating Lueker? Where was Charles Conlon that day at Hilltop? Where were others? I respectfully disagree. The players' strike is more significant and newsworthy than Cobb laying the smackdown on a fan. Do the 3000 hit milestones and 300 win milestones not count toward the challenge? These were predictable events after 1920 and still no photographers. I believe the answer is three-part. 1. Nobody really cared a whole lot. It was not until the advent of the radio photo or the wire photo in the late 1920's through the mid 1930's that spot photography or needing shots of an actual event became vogue. Up until this moment, a stock photo would work for nearly any event and public demand for a photographer on hand at every event did not drive the newspapers to be there in case something happened. It was supply and demand and there were stock photos on hand of pretty much every player (supply) and the public did not cry for images of actual events (no demand). 2. Even major newspapers would only have a handful of guys on staff taking pictures so there was absolutely no way to cover every sporting event. Often they would show up for the START of a game, take a few shots and hurry back to their offices to develop the images and make the evening edition. Getting photos of the event was paramount to being there in case something happened later in the game. Every city with a team was big enough to have competing newspapers and that meant an evening edition with deadlines. This is why essentially every major sporting event has pre-game images and almost no surviving images of the aftermath unless they were taken by amateurs. This method survived until wire photos became standard. 3. Major innovations took place in the 1920's to the quality and portability of cameras which is why as the decade wore on, the genre of "photo-journalism" really came into its own. The desire for better photographs was a byproduct of technology and not the other way around. The public did not know they wanted images of actual events until they started to become available, then the desire drove innovation to the advent of the wire photo. It was a different world and the thought of a photographer sticking around for an entire game just in case something important happened was not important. It was a 9-5 job to these guys and they wanted to get the shot and get home to their families just like the rest of us. Rhys—you can tell you’ve looked at a few hundred thousand images. I agree with everything you say in paragraphs (1) and (2): it really wasn’t until October 1920 that newspapers felt they needed photographs of play-by-play to connect with their readers. And most newspaper photo departments were inadequately staffed (this is what had created the opening for the Bain and Thompson agencies). Even when photographers were at a game, they often photographed the first play or first few innings and then went to hand in their negatives for the evening edition. I disagree with what you say in paragraph (3). The pivotal innovation in camera design in 1920 wasn’t making cameras more portable, but less so; making them extremely large by increasing the focal length so they could photograph action at second base. This is what allowed Wambsganss to be photographed. I didn’t mean to diminish the idea that 3,000 hit milestones in the 1920s and 1930’s weren’t photographed; you yourself recognized in a previous post that such milestones weren’t celebrated at the time and didn’t become newsworthy until many years later. Dewey—your point is well taken. It had never occurred to me that someone might think the walkout was historically significant, so I didn’t give it enough thought. I don’t think it would appear on anyone’s list of “100 Classic Baseball Moments,” but others may disagree. I do think the Lueker incident is more interesting, certainly photographically. Had I been a photo editor at the New York Evening Telegram, I would have loved for Conlon to bring back an image of Cobb stomping Lueker. Last edited by sphere and ash; 10-01-2018 at 02:57 PM. 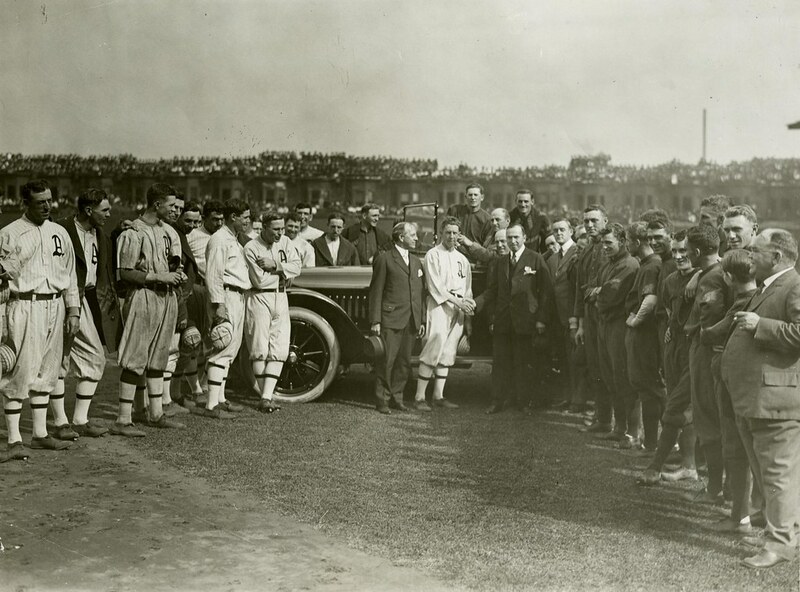 In terms of pre-1920 historically significant moments, the closest we may come are the posed shots of Opening Day festivities, World Series opposing players and managers shaking hands, Chalmers Award (MVP) presentations, Honey Boy Evans trophy (highest BA) presentations, etc. Visit TCMA Ltd. on Facebook! As to my point number (3), the Leica I became available to photographers in 1924-1925 and was the number one innovation in portable photography ever. It made high quality images available via 35mm film. I believe this innovation and those that followed led to many of the more "historical moments" being photographed as cameras overnight went from large clunky devices to something you could fit in your coat pocket, stay for the whole game, and still make the evening papers. Just my opinion. Again, the examples being shown are awesome but ALL Pre-Game images to my point above. Photographers basically did not stay for the actual games which is why the famous moments were not photographed. Many of these early photographers by all accounts were not even sports fans, they just saw business opportunities or were assigned to events by the paper. They might shoot the World Series one day and then not do another sporting event for weeks and cover local beauty pageants and politics (where they would also show up, take a few shots and get home for dinner). I was doing some looking to see if I could find out about film speeds historically. I didn't find any clear answer, but most of the older films were pretty slow. Perhaps too slow to capture action shots reliably on all but the brightest days. When do we actually start to see game action shots being taken? I have several from the 1912 or thereabouts time period. Tom, you are right about at least 1912, I once had about 60 from the World Series along with about 30 glass lantern slide, all action. Nearly all very excellent quality also. Fast shutter speeds capable of capturing on-field action became possible for press photographers when Graflex introduced its single-lens reflex camera in 1905. Below I’ve attached a Graflex ad from 1909 featuring Fred Clarke that stops the motion of a pitched ball as it crosses the plate; it’s pretty staggering that such images were then possible for so many photographers. And it makes clear that the absence of significant moments from 1905-October 1920 had little to do with technology. Some photographers did succeed in capturing action prior to 1905, principally Edweard Muybridge, who captured successive stages of a batter’s swing as part of his Animal Locomotion series in 1887. There was also a horse racing photographer named John C. Hemment, who worked on taking photo finishes, and who took photographs of the Giants warming up around 1890 (by the way, I would like to buy any Hemments you have; I know they’re out there). Last edited by sphere and ash; 09-18-2018 at 03:56 PM. See that guy on the right holding the very large camera? He took the first photograph of a memorable moment on a ball field in October 1920 when he captured the Wambsganss triple play. The camera is his own invention—it’s a Graflex whose bellows has been extended. It’s based on the cameras he used while working in aerial reconnaissance during the Great War. This was the final piece of the puzzle for capturing on-field action. Baseball photography would never be the same. Last edited by sphere and ash; 09-19-2018 at 10:15 AM. There's a big difference between shots taken for camera publicity and normal game action photos. 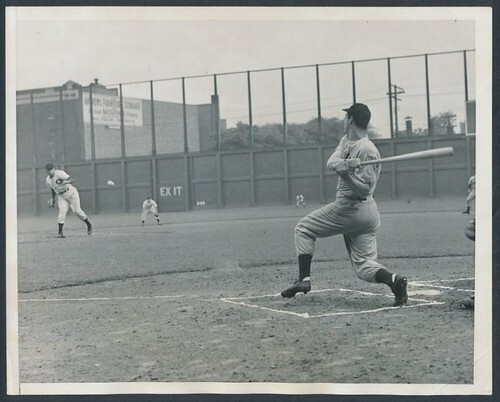 Looking at the graflex image, see how shallow the depth of focus is, and that he's not actually batting. (Unless he's way way out of the box. ) Fast camera, optimal conditions, fast film, and maybe extra lighting or special processing. And there it is. A nice, but not usual photograph. It's not shutter speed, but film speed, and the speed of loading, and how much film the photographer could carry that allows more to be captured. The portability/usability of the camera also helps. Muybridge used an array of 24 cameras, all set up and fixed in a small building. Hement would have also used a stationary camera for photo finishes. The difference with both is that the area to focus on is at a fixed distance, allowing the photographer to use a very wide aperture, (If the camera had an adjustable one) and fixed focus in a pretty narrow range. When faster films came along, that allowed tighter apertures and deeper fields of focus, making it possible to quickly change from a nearby subject to one farther away. The extended camera is pretty cool, it's also technology, and with that long bellows would have had a deep field of focus. Steve—I agree on Muybridge. His methods are not compatible with on-field action. I was just trying to give a short history of action photography. My point was that by 1905 photographers had everything they needed to capture plays at home, first or third. Things got a little harder in 1910 when Lynch barred photographers from the field in the National League, but Conlon was still able to capture Cobb sliding into Jimmy Austin at American League (Hilltop) Park that same year. Better technologies would have increased the probability of capturing a memorable moment, but only if photographers were there and trying to capture those moments. Why didn’t anyone capture Ray Chapman as he lay stricken, minute after minute, or as the umpire shouted to the stands asking for a doctor, or as Chapman was carried by Speaker and Wood? All of the technology existed. The New York Daily News had a photographer there. It’s almost certain that he left before the beaning. The primary reason no memorable moments were photographed before October 1920: there was no demand for them. That changed with the birth of the tabloid press. Last edited by sphere and ash; 09-20-2018 at 06:53 AM. The picture of my grandfather playing in an exhibition game in San Diego, CA, against Babe Ruth. How about a professional photo of Ruth calling his shot in the 1932 World Series ---- or doing whatever other gesticulating the two grainy home videos shot from the stands show? Why didn’t anyone capture Ray Chapman as he lay stricken, minute after minute, or as the umpire shouted to the stands asking for a doctor, or as Chapman was carried by Speaker and Wood? All of the technology existed. The New York Daily News had a photographer there. It’s almost certain that he just left before the beaning. The primary reason no memorable moments were photographed before October 1920: there was no demand for them. That changed with the birth of the tabloid press. And we’ve come a long way... look at us now! That's certainly a part of it as well. The photographer probably had his assignment, and as much film as he felt he needed. I'm not sure how much film they'd have carried back then, 4x5 negatives in carriers are pretty bulky, Maybe 25? Maybe 50? I can easily see him leaving once he'd gotten what he'd been assigned. The guy my friend met probably would have too, if the extra for getting the unexpected wasn't so much. Back then there was also a bit of respect for peoples bad moments, so he might not have taken pics if he was there. That wasn't true for all photographers, some of the crime scene/accident photos they actually published would never make it to press today. I met a semi pro photographer who claimed to have been at an airshow disaster. Supposedly he had the event in his viewfinder and couldn't take the picture, or any of the aftermath. The photo I wish I'd taken but never got around to. Not a notable moment, and I had a few years to do it. There was some pretty nasty grafitti about Stan Papi on the outside wall of Fenway park. On Lansdowne, past the gate for the bleachers. It stayed there for years until the new owners had it removed. To me it eventually came to symbolize just how lazy the old ownership had been. And how little the cared about the players. You’re absolutely right about this—there are no news photographs of Ruth’s called shot. Having said that, it’s not possible to photograph something that never happened. The pre 1920 photos concentrated on the ceremonial: a flag raising, meetings at home plate with umpires or team captains, the size of the crowd for an important game...that sort of thing. We have a couple of astounding group shots of the all star teams. For example, the group put together for the Addie Joss tribute game and for the series of exhibitions against Connie Mack's Athletics prior to a World Series. Don't forget the action shot of Ty Cobb sliding into third against Home Run Baker that supposedly exonerated Cobb of intentionally spiking Baker (although if you look closely at Baker, he appears to be at least two feet to the outfield side of third as Cobb approaches the base). This makes you think Cobb ran the bases like an ape. If you lived in New York City in 1910, there would have been 228 major league games played between April and October. That's 2052 innings. At some point, a lot of editors might have said, "Haven't we done enough of that this year." Beanings....I have a Paul Thompson credited shot of Geo. Moriarity being carried off the field when he was with Detroit (the circumstances of his injury are not explained), but beanings, let's face it, happened a lot. A minor leaguer, John Dodge, had been killed a few years earlier, but it doesn't appear to have been big news. There is a shot of an unconscious Babe Ruth from the twenties, Mickey Cochrane in 1937 in New York, and plenty of shots of an injured Pete Reiser. There are more. Finally, the Detroit Tigers sympathy walkout. I had no idea even one photo existed of the players leaving the field until I looked at this thread. Al Travers, the unfortunate who pitched that day for Detroit, said in an interview years later that his photo had been in the paper the following day. This was significant to him in that his mother was convinced union goons would converge on their house. There doesn't appear to be a photo of the one-day Tigers, which is a pity. The question is why these photographic conventions became common: they’re easy and don’t require the photographer to stay for the entire game, allowing them to make the evening edition. Somewhere I have the last image of Chapman ever taken—when I find it I’ll post it here. It was taken in Cleveland; Chapman died in New York. I’ll end where I started this thread: I think images of the Chapman beaning are the greatest baseball photographs not taken. You just can’t exceed the pathos of an umpire yelling into the stands for a doctor, already knowing that it’s almost futile. And you can’t exceed the pathos and composition of Chapman being carried, echoing the Descent from the Cross, to the clubhouse in center field. Last edited by sphere and ash; 09-22-2018 at 10:55 AM. Waddell striking out the side while he has his fielders lined up on the foul line. Last edited by packs; 09-22-2018 at 01:11 PM. I'm not sure of the number of batters who were hit by pitched balls in those days, but as there were no protective helmets, anybody who was hit was in a life threatening situation. Remember, Walter Johnson, unintentionally wild, was always afraid he would kill a hitter. The first game I ever attended was in Detroit in 1956. A Tigers pitcher sent Vic Power flying. Power left the field for a moment and returned wearing a plastic helmet, which wasn't mandatory until 1957. The crowd thought the entire episode was greatly amusing. I remember that well. impossible to avoid. That happened with Tony C., too, didn't it. The old local television adage, "If it bleeds, it leads." Well, an unexpected result. Looking for info on something I got today I came across this. hopefully the link works. While it's not baseball it is an important sports event. It's a photo and short article about a fatality during an Army football game in 1909. The photo taken just before the player was killed during a play. That prompted the rest of the season for Army to be cancelled. You are much more likely to find game moments prior to 1920 depicted in RPPCs taken by fans than professional photographers. Cameras for the common man were all the rage during the Deadball Era. Here is a link to a thread providing the details about a game action RPPC depicting the key moment in the 9th inning of Game 3 of the 1912 World Series at Fenway. 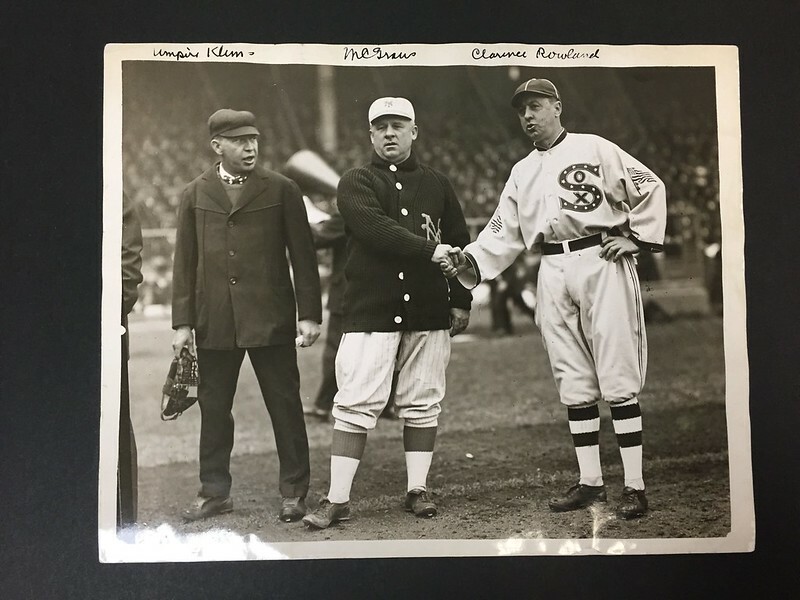 It’s a great real photo postcard, and its presence underscores the absence of any image of Fred Snodgrass’ muff in game 8.